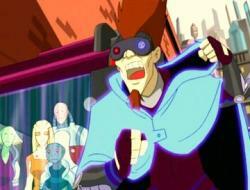 Jammerhead is the leader of the Street Phantoms and the first villain the Turtles fight in “Fast Forward”. He is a cyborg and has appeared in the following episodes: Future Shellshock!, Playtime’s Over, Invasion of the Bodyjacker and Enter the Jammerhead. A Jammerhead action figure was released in the standard wave ofFast Forward figures in 2006. In 2008, a Mini-Mutants version was released, packaged with Extreme Sports Leonardo.